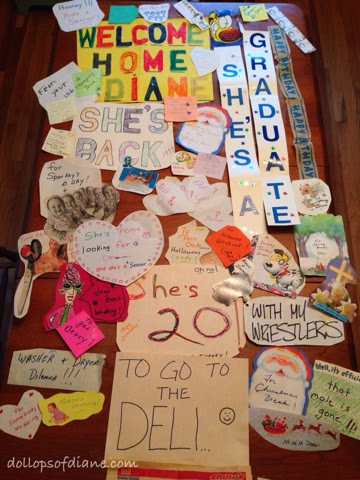 The first time I came home from college I was welcomed by a homemade sign my mother had put on my bedroom door. For whatever reason, neither my mom nor I took the sign down that day. That decision turned out to be a pretty important one since it started the unofficial tradition of my mother leaving a note on my door EVERY single time I came back home. They ranged from holidays, to doctor appointments, to weddings, to random events. Not a trip home went by that there wasn't a note or sign or decoration added to that bedroom door. The signs were creative, heartfelt, and funny - just like my mom. I only moved back home for a short few months after college and it was a turbulent time in my life. My mother kept the signs up regardless. Just a couple short years after that, with my mother's ever declining health, it was necessary to do renovations to the house to make it handicapped accessible for her. The walls (and door) to my childhood bedroom would be removed to make a larger room for her. At that time it would have been easy for her to just throw away the notes but instead she carefully took down the signs, saved as many as she could, and packaged them up for me. Now I occasionally lay out the notes and I like to think of my mom making them - of her sitting in her usual spot at the kitchen table, touching these papers, and writing. As she got more ill, her fine motor skills no longer worked and she lost the ability to write, and cut, and glue. But not on this door - on this door of memories she can write just fine. She is smart and witty and capable. I honestly struggle sometimes to remember her that way. For the last few years of her life, the muscle disorder that she had did such a number on her physically and mentally. It's hard for me not to remember her that way. I cherish these notes because they so clearly remind me of the person she was before she was so very sick. They remind me of the mom who I grew up with and the mom who cared for me before our roles were reversed. Today would have been my mom's 60th birthday. I can only imagine that there's a door up in heaven with the sign "Happy Birthday, Rose!" on it. She deserves all the celebrating in the world.